The golden principle of customer service is to provide help or service to each and every customer UNCONDITIONALLY, without any feeling of expectation of reciprocation or inconvenience being created. Do something for your customers as if it is no bother at all to you. In fact, perform the service in such a way that your customer believes that the performance of that service for them by you is actually giving you PLEASURE . And perform the act of service in such a way that the customer does not feel inclined to reward you or reciprocate any form of favour, and if such reward or favour is offered, it is graciously declined. Your service must be offered unconditionally. Putting it simply, people do business with people they like. I’ve done business with businesses who have had great employees, but when those employees have moved on, I’ve taken my business elsewhere even when it was inconvenient to do so, just so I did not have to deal with people who begrudgingly wanted my custom. Twenty to twenty five percent of the population will happily do business with you without being concerned about what you charge or what your competitors are charging, because they believe that your business provides them with exceptional service and value. And that’s unconditional five star world class service. It’s a nice section of the market to work with. One of the problems with running an organisation, any organisation, is that for that organisation to be successful long term it needs to have an iconic form of leadership displayed by the person in charge. You cannot be a weak leader. And you cannot be seen to be incongruous with the message you are trying to send to your organisation. Weak leaders convey weak messages. Their messages are sent without conviction and without consequence and follow up. And when this happens, then acts of anarchy start to become accepted. Initially these acts are sporadically placed, but as time goes on they become more regular. Weak leaders get spoken about [in a negative manner] behind their own backs. Weak leaders do not command the respect of those they lead. Weak leaders only draw contempt from those they seek to rule. And that provides little foundation for success. In fact, it creates the expectation of underperformance and of failure. With weak leaders there is incongruity in the message they convey. And there is also incongruity in messages that they purvey. This second incongruity occurs when a message is purveyed by the leader, and then by their own actions, the leader behaves in a manner that is incongruous with the behaviour just previously requested and expected. My friend Shep Hyken wrote this week about the problems caused by incongruent leadership. He said that when, for example, we see leadership complaining about customers, what we latter see in that organisation is a granting of permission for employees to do the same. And a domino effect is created. Shep said that employees seek guidance from their leadership and look at them as role models. He said that when leadership in an organisation talks poorly about a customer, it will soon follow that employees will soon talk about the customers in a similar way. Shep said that in the professional world, we learn to embody our company’s core values by watching organisation leaders set an example. I agree with Shep when he said that leadership sets the tone. This is because leaders are the role models for the rest of the employees. Everyone’s eyes and ears are focused on their leadership. And even if you aren’t a president or CEO of a company, you still can take a stance and set the standard for how you want those around you to behave. One of the best things about working in a dental practice is the fact that everybody who contacts your office with a treatment enquiry of any sort is contacting your office because they NEED that treatment. Or they THINK they need that treatment. They are in need of that treatment. Just take a minute to think about this…. Remember, dentistry is a GRUDGE BUY. Like buying new tyres for your car. Or paying your Land Tax. It’s something that when people have to get it done most people do so begrudgingly. It just DOES NOT happen. When someone phones your dental practice asking for the price you charge for a procedure, what that really means is that THEY [that person calling] NEED that procedure that they are enquiring about. Yet most dental offices do not understand this fact. What most dental offices think when someone rings them about a price, for a procedure, is that the person ringing is doing so as part of some ritual of checking for the lowest price possible. This belief is totally wrong. The reason someone calls your dental office and asks for the price of a particular dental procedure is that they simply do not know what else they should be asking. Otherwise they would be asking THAT question instead of asking the price question. They are NOT calling for a pizza. So what your front office people need to do is find out more about why they NEED a checkup and a clean, rather than simply go and BLURT OUT a number and wishfully hope that that number will be a catalyst for further conversation. Because a number on its own is not an answer. So what should we say, then? Please note that all these questions acknowledge the caller’s problem, but then dig deeper, twice, into that problem to extract more [much needed] information. So that we can show concern and also raise concern in the caller. By asking further questions we are able to lead the conversation toward the prime purpose of the call. And that is for the caller to make an appointment and for them to be happy that they are getting their problem addressed as quickly as possible. You see, no other dental practice is providing this sort of interest and attention to the caller’s problem on the phone. You must remember that the caller has already decided that they want your dental practice to be fixing their problem, because otherwise they would have phoned another dentist instead. They’ve done their online research of you already. And they are calling your office to make an appointment. They just don’t really know exactly how to do that…. So they ask the price. When we realise that the price question is simply a GHOST, and is not the true question, and when we understand the way to address that ghost and to navigate around that ghost and into the desired appointment, then it is only then that we raise our own bar, and schedule more new patient appointments that get kept, and are attended. The average dental practice out there schedules one in five phone calls into an appointment, and only 43% of those scheduled actually end up attending. Which means that only eight percent of callers ever actually become patients at the “average” dental practice. 92% of callers end up going elsewhere. And it’s simply because of the poor way that our dental office phones are answered. Can you afford to be dropping 92% of your new patient phone enquiries straight into the bin? Wouldn’t it be smarter to fix the way that new patient calls to your practice were answered? So that more people made and kept appointments. Do you need your dental phones monitored? Do you think your dental phones could bee answered better? The dental treatment room, or operatory, is the room where patients receive their dental treatment, as provided by the dentist or the dental hygienist. The key purpose of the treatment room is to provide treatment to the patient comfortably and efficiently. And one of the most efficient ways of being efficient is to provide treatment in the shortest possible time. Nobody wants to sit in a dental chair having treatment for one minute longer than they have to. As a dental team, we have the ability to control the amount of time a dental procedure takes to complete. And one of the key factors that affects the amount of time a procedure takes is preparation. When you have prepared well, then things go well. When you have failed to prepare, you have actually prepared yourself to experience some form of failure. This preparation can be something simple, such as having all instruments and supplies out and at easy reach, rather than having to open a drawer, or a cupboard, when the instrument is needed. I marvel at how some dental offices actually store instruments and supplies that are needed for dental procedures in areas of the practice that patients are not treated in. So that when those instruments and supplies are required, the dental assistant has to physically leave the treatment room and go gather [and assemble] the items for use. It is better to have all instruments and materials that will be needed [and also could be needed] ready and available in the treatment room for when they are needed. And not only should they be in the treatment room, but they should also be out [that means NOT in a drawer and not in a cupboard]. Why should the patient be kept waiting for instruments and materials to be removed from places of storage? You wouldn’t like going to a restaurant and sitting down at a table and not having silverware [cutlery] or side plates and glasses? After all, you are in a restaurant to eat a meal, and a knife, fork and spoon is usually what you would expect to see ready and waiting for you. Similarly, if a patient was attending a dental practice to have a composite resin restoration placed, then they might expect that the filling materials, bonding materials and matrixes and polishing materials would be laid out in preparation, along with any local anaesthetic, and Miller’s forceps with articulating paper already loaded. Yet, despite dental practices having this ability to pre-plan and pre-set, I still see practices where dental assistants are fishing into drawers for polishing discs and for articulating paper, while patients sit open mouthed and waiting in the dental chair. And that does not make any sense to me whatsoever. Or, back in the day, when it was time to place retraction cord, it seemed a lot more logical to me to have the necessary cords available, out and pre-cut, ready for application and insertion, as opposed to having the dental assistant go fishing in the drawer for the bottles, and go hunting in the steri-bay for some scissors, and then painstakingly measure and cut the required lengths of cord, while the dentist waited patiently holding the patient’s mouth open…. One of my dentist friends tells the story about doing a locum session at a dental practice, where the patient in the dental chair required a pulpal extirpation, which had not been planned. So he asked the dental assistant for an endo tray, explaining what the patient was needing. And the dental assistant left the treatment room…. The dentist then excused himself from the patient and went in search of his missing dental assistant. In this case, having the endo instruments, or an extirpation tray prepared and ready and at hand would have allowed the team to seamlessly swing across into action without delay, in a highly professional manner. Not having the endo-tray ready made the whole dental office look amateurish and unprepared. And this is what patients remember. Patients will marvel at your seamless systems and how your dental procedures flow effortlessly, and this comes as a result of being well prepared in advance for everything we know is going to happen, and more, in the dental operatory. “With Customer Service, there is no FINISH Line…” – David Moffet. Providing World Class Customer Service becomes an obsession. You become engrossed and absorbed in trying to do things better for your customers. So you never are “done” with Customer Service. You want every customer’s experience to be better for them today than it was for them on the last time that they visited with you. 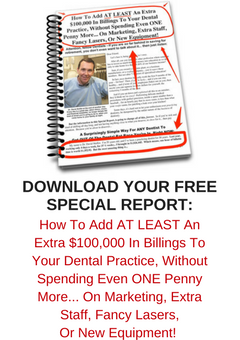 Why should your patients not look forward to their visit with you, knowing that your dental practice is driven to exceed their expectations each and every time? At my dental practice, every morning, before the first patient arrived, my team would conduct our daily morning huddle. The purpose of the huddle was not so much to go over the treatment that each patient of the day would be having, but it was more for the team to go over exactly WHO each patient was and WHERE we were at in terms of our knowledge about that patient and what their customer service expectations would be. Every team member left that daily huddle knowing exactly who was coming in that day and what we needed to do to meet and exceed their customer service expectations. In particular, we had several patients of the practice whose demographics and social situations put them “outside” of what we considered would be our typical patient profile [for our practice]. And although those people were different from our typical patient profile, they kept on coming back to see us, time and time again. “Bob is not our typical practice patient. Yet he keeps coming back. Year in and year out. We need to find out EXACTLY what it is that keeps Bob coming back to us…. Who is your dental practice Bob? Who is the Bob at your dental practice? Who is the patient who swears blindly to you that you will always be their dentist? Are you taking note of what it is that you do that keeps your Bob returning? And are you committed to setting that standard as a non-negotiable business standard for your dental practice to uphold? Because when you do commit, and I mean truly, DO commit, to ongoing excellence and the challenge of maintaining that excellence in service, then and only then can your business be truly inducted into the brotherhood of providers of truly World Class Dental Customer Service. And that’s a great place to be. Are You Sure Of Your Obligations As An Employer? A couple of weeks ago the Federal Court of Australia passed a judgement that a claim lodged by dentist for unpaid superannuation payments be paid to him by the organisation that engaged him. The dentist had been engaged by the organisation as a “contractor” and the court ruled that under the superannuation laws the dentist was deemed to be eligible for the unpaid superannuation entitlements. However claims by the same dentist for unpaid annual leave and unpaid long service leave were dismissed as under those acts, the dentist was ruled to be ineligible. And you would think so…. Same situation, three different awards. Two rulings one way, and one ruling the other way. One commentator asked how this can be so? And I am not sure. The ATO website says that if you are primarily exchanging your labour for [units of] money then you are deemed an employee. And seeing that the dentist in this situation was doing that, you would think he would have been an employee in all situations. And be entitled to claim ALL of his unpaid entitlements. After all, he turned up, with only his hands and his education, and without any equipment or uniforms, and was provided with the tools and the materials and the chairs and the staff to be able to treat the patients who were appointed to him by the organisation. And the patients were deemed to be owned by the organisation. The patient treatment records were all owned by the organisation. The dentist just provided “sweat equity” only. Yet there was no equity. Importantly, this ruling on superannuation is not time restricted. In fact, in a previous independent action, the Federal Government of Australia has already some time ago paid and back paid superannuation entitlements to “contractor” dentists that it engaged. It seems there is now a definite precedent for further claims by all dentists engaged in similar situations.…. and maybe other professions could be interested as well. And I would imagine the fines that the ATO would impose on any organisation failing its superannuation responsibilities, could be significant. Agreements that are set up to imply that employees who provide labour are somehow “contractors” running their own businesses are usually written with the primary intention of avoidance of paying payroll tax by the organisations. And superannuation obligations it would seem. And as the ATO website says, just because that’s the way it has always been done, and just because everyone else is doing it this way, doesn’t mean it’s the right way. Any resemblance of any person, character, entity, organisation or charity described in this article to any person or entity living, or dead, or unborn, or uncreated, is purely coincidental, imaginary and delusionary. Readers of this article interested in comparing their own situations to those imaginary situations described in this article should employ their own due diligences.